Yesterday's post looked at how deeply Jesus' felt how lost and directionless the crowd was - and how His response to this was not only to feel compassion for them - but also to DO something about it. Today's verse comes from a larger passage that begins in Luke 8:42. As Jesus is heading on his way to heal someone's sick daughter - a woman - a sick woman - sick with a kind of illness that left her cut off - isolated - probably destitute and devastated - approaches Him and secretly reaches out and touches Him. Two things happen immediately: She's healed. Jesus knows it. This story gets me in the feels - because this woman is enduring not only the problem of being sickly - but the - as likely as not - much bigger problem of being shamed. Jesus could've not healed her. Shoot - He could've even UN-healed her. He could've ignored her. Of course - none of that is what happened. 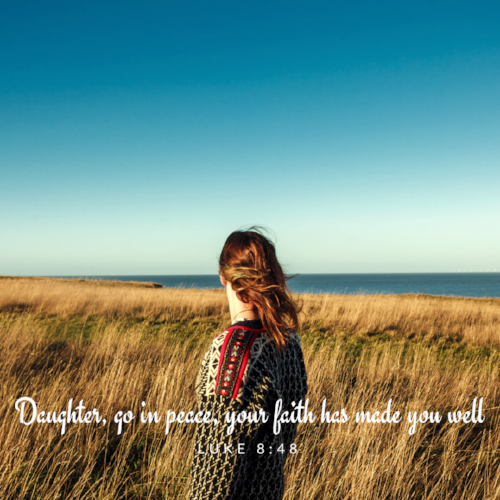 Jesus calls her "Daughter" - a tender address indeed - unlike the way He addressed every other woman. And then He tells her - that it was her faith that healed her. Usually He asked people if they had faith - but not this woman. He tells the whole crowd that HER faith healed her. He didn't even keep any credit for Himself. He fully restored this woman in that moment. Years of misery. Endless days of shame - REMOVED. He healed both the physical problem and it's terrible social result. Shame and sickness gone: esteem and praise in its place. This passage doesn't include the word love - but I'd argue that it speaks it loud and clear. March 06, 2018 /JC's Village C.C.M.